The only effective treatment for 'failing' Kasai portoenterostomy is liver transplantation (LT). However, to maximise a patient's chances to achieve the proclaimed >95% survival with sequential surgical management, medical follow-up and treatment must be planned carefully. 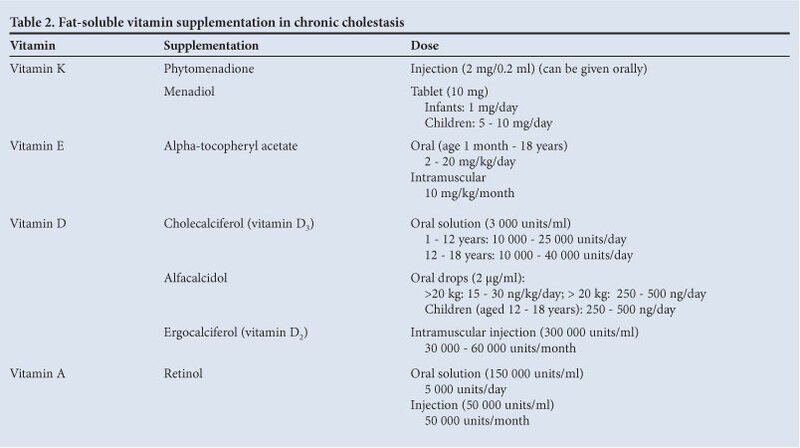 This includes routine fat-soluble vitamin supplementation with choleretics, aggressive nutritional support, regular ultrasonography, optimal general paediatric care, and psychological support for the family once complications arise. Careful timing of LT is of critical importance, although recent trends include earlier consideration of LT in children with biliary atresia. This management can only be offered through centralised, specialised national services. Due to its ramifications in paediatric surgery, dietetics, metabolic, social, adolescent and transplantation medicine, paediatric hepatology is a fine example of patient care that is genuinely multidisciplinary. The primary LT approach for infants who present timely with BA has been discouraged.3 Centralised medical management and sequential surgical options usually provide long-term survival with good quality of life for about 95% of these children.4 However, the morbidity and mortality for these complex procedures are not insignificant and will never be completely removed, despite advances in their management. The deferral of LT has many surgical and medical advantages, including the size of the older recipients, exposure to a far broader deceased donor organ pool, completion of immunisation schedules, longer exposure with seroconversion to community infections, and better psychological preparation. Complex pathways of care must be developed to enable these children to achieve good medical progress, with minimal complications and appropriate neurological, intellectual and social development, and maximal integration into society. What is failed Kasai portoenterostomy? Kasai portoenterostomy (KPE) procedure aims to restore bile flow, which is the main prerequisite for the loss of clinical jaundice. The surgical success of KPE is conventionally defined as complete normalisation of serum bilirubin at either 6 or 12 months of age.1 Normal stool pigmentation is often seen in these children, although this could be associated with inadequate bile flow and persistent jaundice. Failure to achieve clearance of jaundice (i.e. early 'failed' KPE) mimics the natural history of BA and represents an early indication for LT, similar to primary LT due to a late referral or undiagnosed BA. However, the clearance of jaundice does not necessarily equate with the absence of CLD complications (for categorisation see Table 1), although many complications overlap in clinical practice. The most common indications for considering LT in children with BA are abdominal distension secondary to synthetic function failure (ascites) and recurrent gastro-intestinal bleeding. Children with partially successful KPE must be monitored 3-monthly with abdominal ultrasound to assess: (i) arterial flow (hepatic artery resistance index); (ii) the progression of splenomegaly; and (iii) the development of focal lesions. Most focal lesions are non-vascularised regenerative nodules (nodular regenerative hyperplasia) within cirrhotic livers, but about 1 - 2% of BA children develop hepatocellular carcinoma (HCC), which could also be an incidental finding at the time of LT.5 To delineate the lesion, additional axial imaging with magnetic resonance imaging (MRI) or multiphase contrast computed tomography (CT) is often required. Malignancies are not always associated with elevated alpha-fetoprotein, but 6-monthly monitoring, at least, is recommended.5 In addition to standard biochemical markers of liver function, serum levels of fat-soluble vitamins, calcium, phosphate and alkaline phosphatase should be assessed during routine clinic visits. There is little scientific evidence for the long-term benefits of pharmacological treatment in BA. The use of steroids in the immediate post-operative period is discussed elsewhere. Choleretic medications, such as ursodeoxycholic acid (UDCA), phenobarbitone or low-dose rifampicin, are often used. Cholestyramine can be helpful for clearing jaundice in the early post-operative stages, but its interference with the gastro-intestinal absorption of other nutrients outweighs its medium-to long-term benefits. The supportive role of adequate nutrition after corrective surgery for BA cannot be overemphasised.6 Children with BA become malnourished for multiple and overlapping reasons, including increased energy expenditure, poor bile-flow-related malabsorption, chronic enteropathy secondary to portal hypertension (PHT), and relative restriction in physical activity.7 Their nutritional assessment should include detailed anthropometry (mid-arm circumference, skin-fold thickness and head circumference) and height, as simple weight monitoring could be misleading due to progressive hepatosplenomegaly and fluid retention. Regular supplementation with fat-soluble vitamins (A, D, E and K) should be established. If failure of routine oral supplementation is detected due to prematurity, severe cholestasis, poor medication adherence, dark skin colour or any other reason, then more aggressive parenteral regimens with monthly intramuscular injections should be introduced. Standard and enhanced supplementation schedules practised at our centre are summarised in Table 2. Nutritional interventions include special medium-chain triglyceride-based milk formulas, which do not require bile salts for effective intestinal absorption. These formulas are often constituted in more concentrated, smaller volumes to counteract the mechanical effects of PHT in these children. The next step in nutritional management is naso-gastric feeding (either partial at the end of each feed or continuous overnight). The effects are often dramatic on nutritional condition, neurological development and the number of infections, and occasionally on symptoms such as jaundice and itching.8,9 The patients' families usually have no difficulty managing infusion pumps and specialised formulas at home. Percutaneous endoscopic gastrostomy (PEG) feeding, which has a clear role in managing other forms of nutritional difficulties in childhood, is best avoided in children with CLD. Most of these children have PHT, which often becomes more significant with PEG insertion, leading to worsening of the existing PHT and often to peristomal varices and associated complications. In all forms of nutritional support, it is important to maintain a regular oral intake (no matter how small) during infancy. Failure to do so could lead to ongoing behavioural feeding difficulties, which are very resistant to management, even after successful LT. The most challenging cases for medical management post-KPE include children who have not completely cleared their jaundice, but do not yet qualify for LT. Common problems include nose bleeding, easy bruising, itching, tiredness and lack of concentration, with suboptimal academic achievements. Fat-soluble vitamin supplementation, including vitamin K, is all that can be arranged for the coagulopathy, with occasional additional parenteral vitamin K (10 mg) during intercurrent infections, if required. With significant splenomegaly, there is anecdotal experience of a potential risk for rupture following direct abdominal trauma, but the real risks are difficult to quantify. We typically recommend that children with splenomegaly and platelet counts <100x109/l avoid contact sports. In some countries, protective shields for the spleen are recommended; however, this is not our practice. Chronic pruritus, secondary to abnormal bile flow and retention of pruritogenic chemicals, including bile acids, usually heralds decompensation of the liver disease. This symptom is usually not as severe as in other conditions such as progressive familial intrahepatic cholestasis or Alagille syndrome. To alleviate the itching, we recommend UDCA (20 mg/kg/day) and rifampicin (up to 10 mg/kg/day), before attempting antihistamines such as alimemazine, opiate- (naltrexone) or serotonin-antagonists (ondansetron).10 Failure to control the itching associated with BA with these medications is a definite indication for LT; further, more aggressive anti-pruritic measures are not justified. After KPE, the remodelled biliary substitute has very little or no peristalsis, which is a physiological deterrent for microbial invasion of the biliary system. The bile is sterile under normal circumstances. 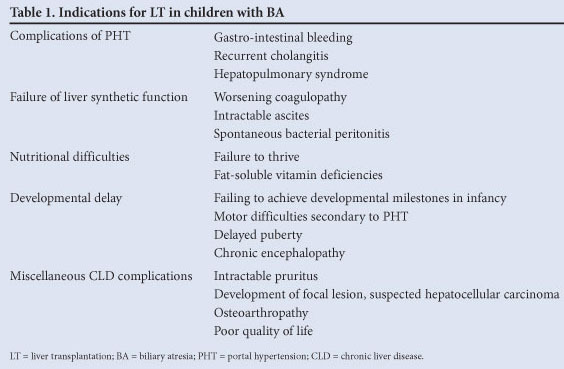 The most common infectious complication in children with BA is ascending cholangitis (AC), which is often caused by intestinal micro-organisms.11 This clinical syndrome has no firmly defined diagnostic criteria and is probably over-diagnosed. Clinically, affected children develop sudden fevers (up to 39 - 40ºC), with jaundice, pale stools and darker urine. The latter is variable and could be related to dehydration. AC typically occurs in children who have practically cleared jaundice; those with poor bile flow usually develop different, more dramatic CLD complications. The additional inflammation of the biliary system could worsen chronic post-KPE histological changes in the liver.11 To minimise the added damage, standard recommendations include the aggressive use of intravenous antibiotics in all children after KPE who develop pyrexia that is unresponsive to paracetamol for longer than 24 hours. Blood cultures are usually negative, but treatment should be given for at least 48 hours after the fever has subsided. AC can be recurrent and occasionally necessitates liver tissue culture and prolonged rotating courses of broad-spectrum antibiotics with good biliary excretion and minimal hepatotoxicity (e.g. ciprofloxacin, co-amoxiclav, co-trimoxazole or cephalosporins). Failure to control AC episodes may indicate a deep-seated chronic biliary infection and represent a bona fide indication for LT. Occasionally, children with BA develop sudden jaundice with no systemic symptoms. In such children, ultrasonography plays a limited role and hepatobiliary scintigraphy is indicated to assess biliary excretion and possible mechanical problems with bile flow. These children could benefit exceptionally from surgical exploration and refashioning of the Roux-en-Y loop,12 consequently avoiding early LT. More frequently, the late-onset jaundice represents a sign of incipient hepatic decompensation and heralds urgent consideration for LT.
Standard measures to control PHT in children with all forms of CLD, including BA, include upper and lower gastro-intestinal endoscopy with variceal banding or sclerotherapy, when indicated. The stools of children with BA are often positive for occult blood, particularly in the first several months after initial surgery. However, any sudden drop in haemoglobin or haematocrit is an indication for endoscopy, irrespective of whether it has been associated with haematemesis, haematochezia or melaena. Some children with PHT develop anorectal varices which also occasionally require sclerotherapy. Exceptionally, additional tests such as barium contrast studies, Meckel's scintigraphy or haemolytic screening are required. Our centre does not perform elective surveillance endoscopies in children with BA due to reliable clinical follow-up based on non-invasive markers (platelet count, portal vein and hepatic artery flows, and hepatic artery resistance on Doppler ultrasound). Furthermore, there are logistical difficulties in scoping all children with BA and anecdotal evidence of triggering gastro-intestinal bleeding following endoscopic intervention. The role of propranolol in primary prevention and post-bleeding management of oesophageal varices in childhood remains controversial.16 Monthly infusions of slow-release octreotide could be considered for gastro-intestinal bleeding from an unidentified source, or for patients not amenable to conventional endoscopy.17 Shunt options, sometimes considered for non-cirrhotic forms of PHT, are contra-indicated in BA due to the possibility of developing dramatic post-operative encephalopathy. Children with BA must be monitored for the development of HPS as it represents a prompt indication for LT; delaying LT could considerably reduce their chances for a successful post-operative outcome. Such patients soon become oxygen-dependent and often remain so for several weeks or even months after LT. In the early transplant era, this complication was a contra-indication for surgery, but increased awareness and meticulous peri-operative and postoperative care have contributed to these children having similar risks and outcomes compared with their peers transplanted for other elective indications. Any chronic illness represents a dramatic burden on family life. Numerous studies suggest that disrupted family dynamics result in a significantly higher prevalence of marital problems, divorces and alcoholism.20 Many children with BA develop psychological problems, including lack of self-confidence, suboptimal academic achievements, risk behaviour, rebellion against domineering parents, and so forth,21,22 most of which peak during adolescence. Furthermore, siblings often feel neglected due to the ongoing attention directed to the child with BA. Consideration for living-related LT can often help address some of these conflicts, but its long-term consequences remain unknown. All children should be managed in anticipation of future LT following KPE, although it may never be required.13 They should be given routine and extended vaccines such as pneumococcus and meningococcus type C (particularly relevant to the BASM subgroup), varicella zoster (VZ) and hepatitis A and B, if not already part of the local immunisation schedule. VZ vaccine is worth emphasising, as frequent chicken pox contacts in the community after LT may warrant the repeated use of expensive VZ immunoglobulins in non-immune immunosuppressed patients. It would be interesting to see whether the routine rotavirus vaccine recently introduced in some countries would affect the prevalence of BA, as this virus has been implicated in some experimental BA models and a few geographical clusters. In our experience, there are broadly two peak periods for consideration of LT in BA in childhood. The first is in infancy, where LT is a life-saving procedure and the living-related option with use of the left lobe segmental graft from a parent is relatively straightforward. The bonus of this early operation is the lack of active memory of the illness and the surgery for the patient. This, however, may eventually result in increased management adherence problems during adolescence. The second is the peri-pubertal period, when suboptimal liver function could lead to stunted growth, delayed puberty, and eventual full-blown decompensation of CLD. The living-related option then becomes more challenging, as these children would probably need a larger right lobe graft. However, this is usually outweighed by the advantages of deferring LT.